It may seem like just a small step for technology when kinetic foot-pressure-powered tiles can charge some cellphones. But what about lighting an entire soccer stadium by players' pressing power? Now, thanks to one company, such a breakthrough is making life better in Brazil. The Pavegen company manufactures tiles that are pressure-powered to generate electricity. 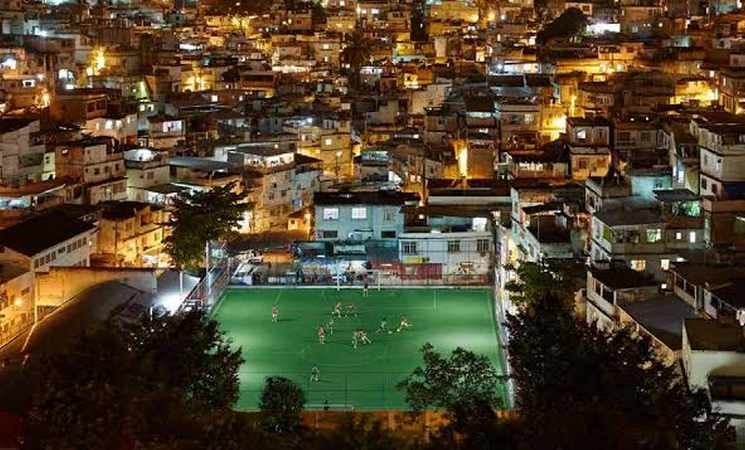 Already a feature in some European schools as well as at the Paris marathon, the company recently partnered with Shell to create its biggest project yet: powering a soccer stadium in an impoverished Brazilian favela. According to gizmag.com, some 200 Pavegen tiles were placed beneath fresh Astroturf, with other tiles along the sidelines. Use of local labor made the project personal to the community. Pavegen's 28 year-old founder/CEO Laurence Kemball-Cook said, "In the two weeks on site in the community, children helped complete the installation. It was a real life science experiment that didn’t stop when school ended for the day." The tiles will provide up to 10 hours of illumination on a full battery charge, with nearby solar panels aiding the power. The push-powered pitch has been in use for about a month now and has already caused the community to rally for renovations and improvements in the area, showing this has been a great idea from soles to goals. She had clobbered Kerber in straight sets in the Brisbane last only a couple of weeks prior online league management, however at the Australian Open Kerber got exact retribution and rode that triumph to her first profession Grand Slam last.